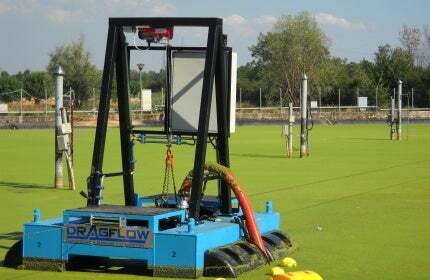 Dragflow’s remote-controlled dredge is the ultimate technology in the dredging sector. Cleaning ponds or extracting sand and gravel from a basin has never been so easy and efficient: the new electric dredge is designed to fit in a 20ft container. It is ready-to-use and allows operators to reach many objectives, as it requires less man power, meaning lower costs, and it’s safer, because no workers are required to be on the barge. Instant view of working depth and pump load on the remote control unit allows for excellent management of dredging activities. The extreme mobility in any kind of swamp and the full floatability allows this dredge to reach most remote locations otherwise impossible to get to with any other equipment. Moving the dredge from one pond to another will no longer require dismounting and re-mounting the equipment. Dragflow’s mini dredges have a pumping capacity of up to 500m³/h with a delivery distance up to 1km. This can make it possible to perform works with the highest productivity ever.